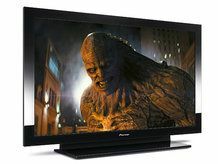 Pioneer's plasma TV... you like, Samsung? In a case that highlights the growing pressure among Asian manufacturers to be the 'big boys' in their respective industries, Pioneer has won damages of over £30m from Samsung after it was proved the Koreans were using Pioneer's copyrighted plasma technology. A trial in Texas found that Samsung had wilfully committed two separate copyright infringements, as it sought to add to its successful LCD business with plasma panels too. The trial spanned eight days in the US courthouse, and the award covers both lost profits and royalties from the infringement. A few divisions of Samsung were in the dock over the misdemeanour, Samsung SDI, Samsung Electronics and Samsung Electronics America all facing the prospect of significant damages. "We are very pleased with the jury's finding," says Mr. Baxter of McKool Smith, Pioneer's law firm, according to Market Watch. "This was a complicated case and we were fortunate to have jurors that closely examined the facts before reaching their verdict."